In soccer, scoring may seem more glamorous than stopping the other team, however both are needed to be successful on the field. The perfect balance between offense and defense is the key to winning games and that is what the University of Wisconsin–Stout Women’s soccer team has done so far in 2015. The Blue Devils’ defense has only allowed 11 goals in the past 12 games they have played. Their goals allowed per game is only 0.87, less than one. On the defensive side of the ball, there are a number of reasons why they have been so successful. The first reason is Paige Meyer (Sr, Beldenville, Wis.), the goalkeeper protecting the net. She has tallied five shutouts on the season so far. Jessica Ingle (So, Auburn, Wash.), a defender who has started every game this season, praised her goalkeeper’s play. “We have a great goalkeeper who rarely lets anything by her,” said Ingle. Meyer is a senior who has seen action since her freshman year. She provides experience to the back line. However, there is much more to the Blue Devils’ defense then just Meyer in the net. “Our back line has been made up of the same six to seven players the past two years who all have played a great amount. I think our chemistry and knowing how each other play is a big reason for our success,” said Meyer. Fellow defender and captain of the Blue Devils, Vanessa Wrobel (Sr, Rockford, Ill.) helps to anchor the defense. “Our back line is strong because we have learned how to play with one another. We have trust back there, which helps when we make mistakes because we are right there to cover for the next defender,” said Wrobel. The team also emphasizes the small things on defense, which prove pivotal in the final outcome of the game. “Our back line is excellent in the air. They can clear any ball played to them,” said Meyer. A trait of any successful team, whether it be in the classroom or on the field, is having great communication with one another. “Our defensive crew works constantly on our communication and it continues to improve. Good communication makes it hard for players to get by us,” said Ingle. Additionally, the team works together not only on the field, but off the field as well. “Our team has really great chemistry on and off the field” said Meyer. To get better it is important to work hard not only during games, but also during practices. “We all bring a great deal of intensity to our games and practices,” said Meyer. With a record of 6-4-2 overall and a 2-2 record in conference, the Blue Devils want to continue their success in conference play. “We are looking to show the conference our way of play,” said Wrobel. The majority of the games left on the schedule are conference games, so the team’s goal of making it to the conference tournament is still in front of them. 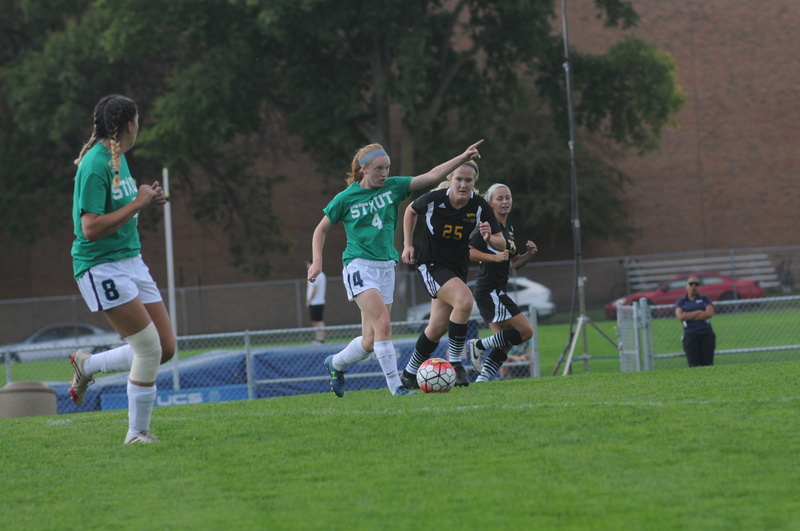 “We hope to continue working hard to get some big WIAC wins coming up. Finishing in the top four of the conference would mean playing in conference playoffs,” said Ingle. UW–Stout has only scored 15 goals on the season and the team’s highest goal scorer is a three-way-tie between Addy Maher (Sr, Racine, Wis.), Jenna Kizlik (Sr, Hammond, Wis.) and Sydney Kasper (Fr, Owatonna, Minn.) with only three goals each. Even though this is the case, the Blue Devils will always have their defense. “Once we score first we are hard to stop and we all understand this as a team,” said Meyer.